Prime Minister Sheikh Haisna on Sunday said her government is in dialogue with Myanmar over the Rohingya issues, but Naypyidaw still remains in a complete inactivity mode. The premier came up with this observation when visiting President of Robert F Kennedy Human Rights Advocacy Organization Kerry Kennedy made a courtesy call on her at PMO in the capital today. “We are having dialogues with Myanmar as it wants to resolve the crisis peacefully. 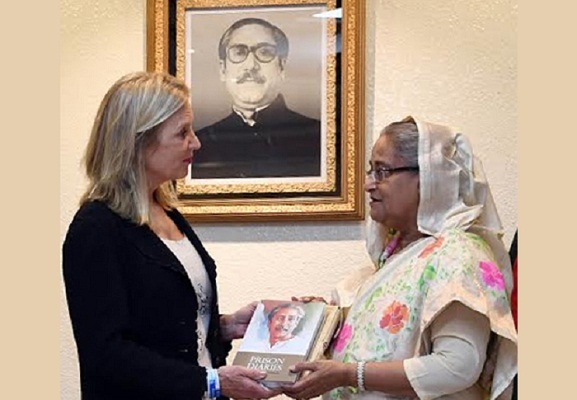 Unfortunately, Myanmar agrees on everything, but doesn’t act on anything,” Hasina said. PM’s daughter and noted autism activist Saima Wazed Hossain, Principal Secretary to the PM Md. Nojibur Rahman and PMO Secretary Md. Sazzadul Hassan were present on the occasion.